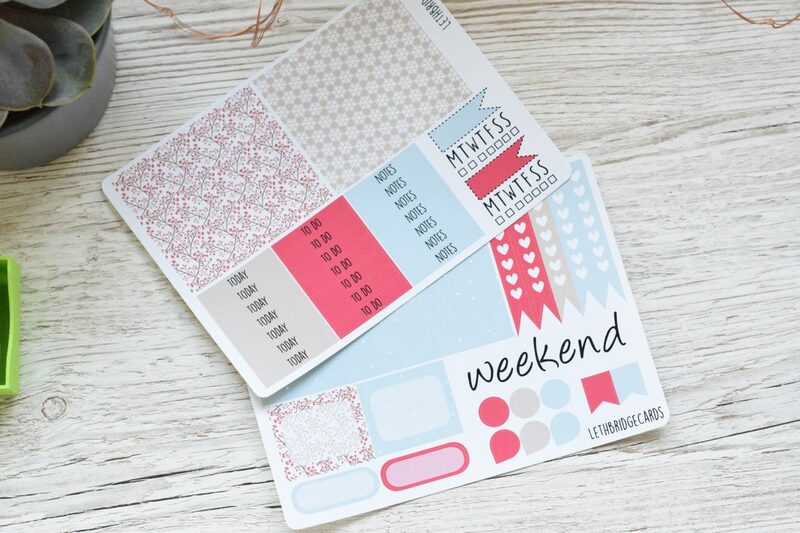 Lethbridgecards November New Releases and Black Friday weekend sale details! There’s been some new exciting things from Lethbridgecards lately so I needed a post to talk about them all! I’m starting my New Years Resolutions early when it comes to the shop this month. I’ve obviously always taken it seriously but this month I’ve felt a change. I’m still happy keeping this as a side hustle alongside my full time job, but I want to do more. Not happy with just a few new releases a month I want to bring fresh new products every week. I want to branch out to more planners that I make stickers for (more on that below). I also want more original content through using less clip art. As you can see, my sheet templates have also had a makeover! This set of cute Christmas stickers were sized with the Erin Condren in mind, but still look awesome in my personal size planner. The style is very different from what you’d normally see on stickers but they’re still incredibly cute. My favourites are definitely the candy canes and the snowmen! Find the sheet here! How cute is the baby snowman?! Continuing with the Christmas theme some countdown stickers were definitely needed. Once again these these are sized to fit EC boxes perfectly while still being small enough for personal sized pages. With the sheet also comes a very cute Christmas Tree that you can decorate yourself with the mini decoration stickers included. I love this idea, decorating your planner Christmas Tree! Sticking with the Christmas theme I finally got around to resizing some of my kits for Happy Planner size! As it was the season, I started with all my festive kits. I also reformatted the kits and added in weekend banners, and new style weekly trackers. I love this mint and gold combo. This is probably my favourite winter kit and I’ve already used it in my Happy Planner! To expand on my Happy Planner range I’ve just ordered a Mini Happy Planner! So keep an eye out on my Instagram for the release of those! After some requests I also released a new kit in Erin Condren and Happy Planner sizes – a succulent and cacti kit. If you follow me on Instagram you’ll know I’ve been using this kit in my health and fitness Happy Planner this week. There’s loads more but I don’t want to make this post too long and besides… I need to get to the Black Friday sale info! I’ve partnered with 38 other shops this weekend so we all have the same coupon code (but different discount levels). My discount value is 25% off with a minimum spend of just £10! My code is valid until the end of Tuesday – happy shopping!